Love his pedigree and color, and promising early horn growth. He would make a beautiful steer or a good bull. He is a tad on the short side. Very strong striking color. going to have some good horn length. Going to be a very handsome fellow as a yearling. Great color, size and horn. Great herd sire prospect. Real proud of this Cowboy Cadence bull calf. BEAUTIFUL BRINDLE BULL CALF. A person could put him on some Rio daughters or grand daughters and do well. Body on this bull calf is impressive. I predict he is going to be a big bull with excellent horn length. Would like to keep interest in him when sold. Looking for an outcross for those Rio Daughters? 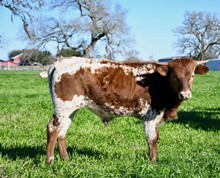 BIG beautiful deep, deep red Longhorn bull calf with excellent horn growth. He is a big boy, and predict will put some size to his progeny. Has an outstanding pedigree. Vanilla Milk Shake, Fifty Fifty, Gunsmoke Titan EOT. LLL Speckles always produces a nice calf, bull or heifer. Horns coming on very well. His sire is getting to be the leading sire in many of the futurities. Very predictable bloodlines in this calf. Swagger bull calf that is really shaping up to be a herd sire prospect. Love the body these calves have. His sire is becoming a prominent winner in the show ring with his heifers, steers and bulls. Big stout bull calf for sale. Look at the color and horn on his dam. Great genetic package in every way. Will be available at weaning.